What The Sound most recently caught up with the boys behind Spinning Coin. Spinning Coin is a Scottish rock quartet who we want you to know. Consisting of Cal Donnelly, Jack Mellin, Sean Armstrong, and Chris White, these Glasgow-based musicians just released "Albany", a hit single via Geographic Music. Geographic is an offshoot of Domino Records and is run by The Pastels, who have been a key indie rock act of the UK music scene for more than two decades now. Before the release of this new single, Spinning Coin had released an EP last October via Fuzzkill Records. "Albany" encompasses sounds varying from an 80's The Cure sounding track to Florida's Surfer Blood with their use of guitar. "Albany" will physically be released on April 15th via a 7-inch that will also include "Sides", a looser and less organized jam. What The Sound: Where is Albany? Albany is a flat in Sauchiehall Street where Sean used to live. WTS: Domino Records posted the music video. You’re signed to them? Is this recent? Yeah that’s recent, we’re actually signed to The Pastels label Geographic, which is an offshoot of Domino based in Glasgow. WTS: Any particular artists on their roster who you really dig? We really like Panda Bear, Alex G, Young Marble Giants, Dirty Projectors, Orange Juice, The Pastels, Robert Wyatt, Bill Ryder Jones, Animal Collective… they’ve done tons of stuff over the years that we like so it’s cool to be a part of it. WTS: You have also worked with Winning Sperm Party. Is this still a thing? 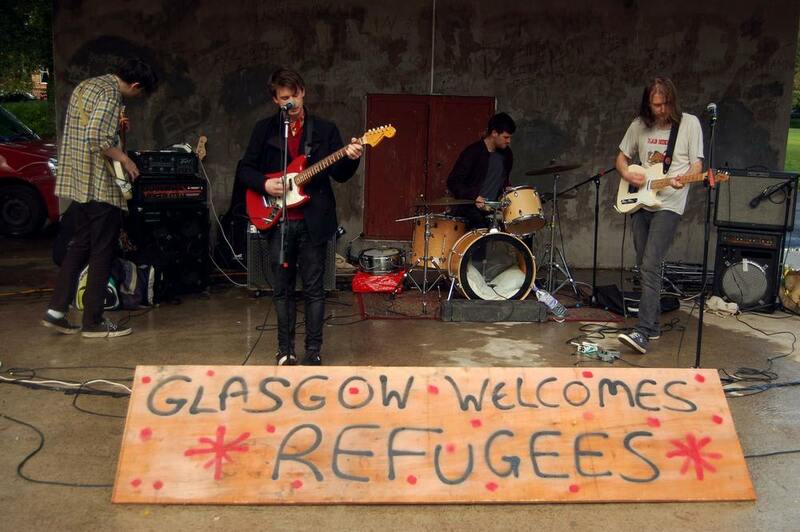 Winning Sperm Party is still going and putting on really good gigs, one of the best being the Glasgow Welcomes Refugees gig in September 2015, which raised a lot of money for the Glasgow Night Shelter. Rob (who runs it) is actually the one who recorded Albany for us which is the one that appears on the 7”. WTS: You’ve got your 7” w/ two tracks, “Albany” and “Sides” coming out this April! Congrats. Totally looking forward to it. When was the last time your band released music? In October we put out an EP with Fuzzkill Records, check them out! WTS: How new is Spinning Coin? When did you begin, how did you meet? Where did “Spinning Coin” come from? WTS: Have you been to the States yet? Any particular city you hope to play in? What about band you hope to play with? Chris has been in the South West, Texas and San Francisco when he played in a band Phat Trophies. We’d quite like to play in like, New York, Chicago, San Francisco (again), New Orleans, Portland….tons of places… We’d really like to play with Teenage Fanclub a lot. WTS: What was the best show you’ve attended in the last year and why was it so great? WTS: Any bands from your city who you bet we don’t know and recommend that we do?